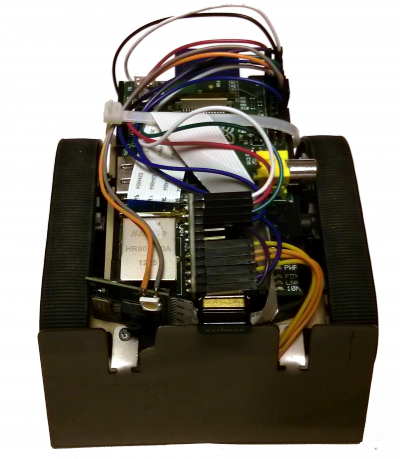 ToyCollect – A Mobile Robot which Collects Toys from Unaccessible Places @Raspberry_Pi #piday #raspberrypi « Adafruit Industries – Makers, hackers, artists, designers and engineers! This build from Dr. Seewald at Seewald Solutions is every parent’s dream come true: a pi powered robot that collects toys from hard to reach places! I was motivated for this project by my two-year old daughter who always hides her toys under the couch. It was quite hard finding out or looking at what lies down below. So we built a robot that can be remote controlled by any Android 4.1+ device via WLAN, can drive under the couch, look at the toys, and move out what toys it finds. It’s just under 6.5cm tall, streams high-quality H264-encoded video in real time, can be controlled with a simple touch-based interface, and we even put in a LED lamp so you can actually see something.